The age old saying 'An apple a day - keeps the doctor away' may now be need to be worded a little different for the benefit of women. 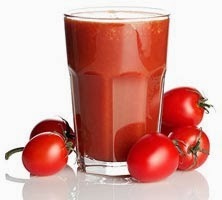 It should now read as: A tomato juice glass a day - may keep the breast cancer away !! A US based research has concluded that the advantages of eating plenty of tomatoes and tomato-based products, even for a short period of time, raised level of adiponectin by nine per cent - sufficient to keep the onset of breast cancer disease at bay. Adiponectin is involved in regulating fat levels and obesity is known to raise the odds of breast cancer.